News from Watertown – This summertime lineup looks great! The Astilbe, Hosta and Daylilies are looking great right now. Sylvie, our Perennial Production Supervisor, gave me a tour of the blocks and they’re full and lush! The Astilbe blocks are loaded with over 24 varieties. At the far right he is holding some monster 3 gallon Sum & Substance Hosta. 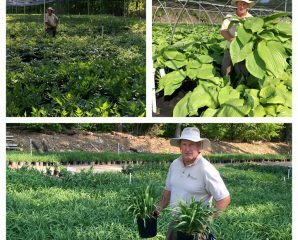 “These Hosta are some of the best we’ve grown in years.” With over 35 varieties it’ll be hard to choose. Stop by and see for yourself or head to the Newtown Yard – we send down two full box trucks every week.